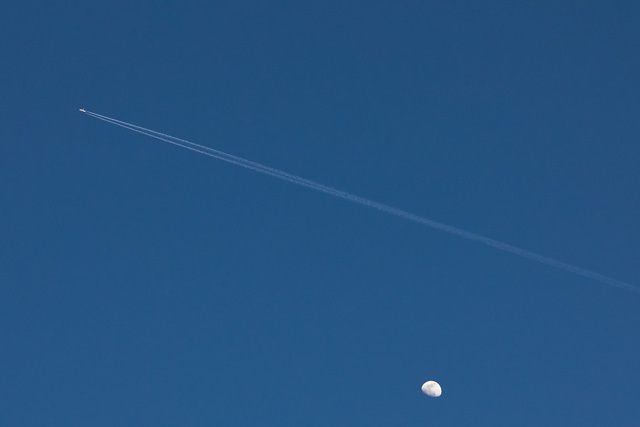 Following last weeks’s “keep it simple” theme, here is another photo with extremely few elements: a plane, its contrail, and the moon, all against an almost uniformly blue sky. Nothing else that distracts the eye. Perhaps the most interesting part of processing this image was choosing how to crop it. By myself, and under the critical eye of my artist wife, I must have tried a dozen crops before we settled on this one. Since there are so few components to the image, how they divide up the frame makes a big difference in whether the end result feels harmonious or not. We decided to place the moon close to the bottom edge of the frame. To me, the moon now almost seems to anchor the image, and makes me wonder what’s beyond it in space.